Voters choose marijuana at the polls. Election night in America proved interesting as voters ushered Republicans into the majority while bringing marijuana a bit more out of the shadows. Up until this election, only two states, Colorado and Washington had taken the big step to legalize pot for recreational use. The jury is still out as far as the wisdom of this decision, but on November 4th, several other states and our nation’s capital plowed ahead with their legalization efforts. Adults over the age of 21 in Oregon may possess up to eight ounces of dried marijuana and up to four plants. The state’s liquor control agency will control all retail sales. Revenues from legal marijuana are expected to be as high as $19 million in fiscal year 2017. Nearly 54 percent of Oregon voters were in favor of the measure. The law will not go into effect until July 1, 2015. Alaska’s vote was a little closer… 52 percent said yes, 48 percent no. Similar measures failed in 2000 and 2004. The initiative is expected to become law sometime in late November. It is similar to Oregon’s plan that would tax and regulate marijuana production and sales. Adults over the age of 21 may possess up to one ounce of pot and grow up to six plants for personal use. Alaska Gov. Sean Parnell said he was not excited about the prospect of legal marijuana, but says he will respect the will of the voters and implement the initiative. The capital city legalized medical marijuana back in 2010 and decriminalized marijuana possession this summer. This election makes it legal to have and use the drug if you are over 21. The new law, which passed easily by a margin of more than 2-1, is expected to go into effect in early 2015. It allows adults to possess up to two ounces for personal use and to grow up to six plants. It also allows people to give up to one ounce to someone else — but you can’t sell it. Congress might still overrule the law. Lawmakers have 60 days to do so. They could also block it by refusing to allow D.C. to spend money on its implementation. This is the one state that bucked the legalization trend. Voters were asked to legalize medical marijuana use. Legalization would have actually required a change in the state constitution, which means it needed 60 percent of the vote to pass. Only 57 percent said yes. Supporters of medical marijuana say this is just one battle in a war they plan to win. Even with all that happened at the polls yesterday… marijuana is still illegal under federal law. As far as employers are concerned, you can still prohibit and screen for drug use among your employees. This landscape is a minefield as far as compliance. Check out some of our resources for help navigating all of these marijuana related changes. 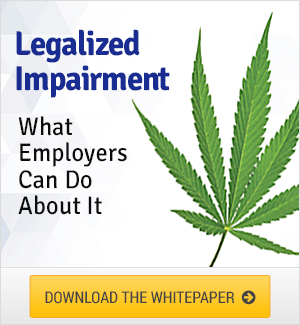 Download our Legalized Impairment white paper, or listen to our recent webinar on marijuana in the workplace. You can find them under Resources on www.ebiinc.com or through the links below.